Here’s how the conversation with my editors went when we discussed today’s post. Editors: You should write about what Louisville has to do to compete with Kentucky. Me: Tragic team bus crash. Explosion. Easy. Next. Editors: No, seriously. How can they beat Kentucky against the odds? Me: Was I stuttering when I said “bus crash”? Editors: Find a different angle. Me: I’ll see what I can cook up. The foregone conclusion in the lead-up to this weekend’s Final Four is that Kentucky will win a national title. I believe that’s a bit premature, since Ohio State is a very good team playing excellent basketball, but I do go along with the implied premise that the ‘Cats will beat up on Louisville on Saturday. So: Everyone thinks Louisville will lose in the Final Four. What this article presupposes is: What if they don’t? Here now are 10 super-important things Louisville has to do stop the ‘Cats from destroying their metaphorical castle door with the battering ram of awesome basketball. I hope this doesn’t happen, because watching Kentucky play fast is the best thing going on in college basketball these days. 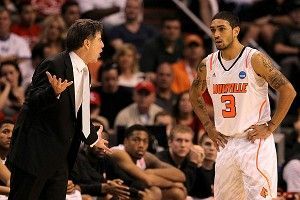 And there’s a good chance it won’t, since Louisville is all about storm and stress on the defensive end. The Cardinals love to create points off turnovers, and they actually play faster than Kentucky on average (125th in adjusted tempo [D-I] to 160th for Kentucky). But Marquis Teague and Doron Lamb and Michael Kidd-Gilchrist will salivate if they see a full- or three-quarter-court press, and the speed with which they break it into a million tiny pieces will create wide open 3s for the likes of Lamb, Darius Miller, and Kyle Wiltjer, and more than a few dunks for Anthony Davis and Terrence Jones. Indiana gave the fast game a try in the Sweet 16, and even though they played brilliantly for large portions of the game, it was a hopeless cause. (I think Baylor was trying to play slower in the Elite Eight, but it was hard to tell amid the smoke of destruction.) Against the ‘Cats, Wisconsin slow-ball is the way to go. Take your time on offense, clog the lane on D, and slow the break. The only good thing Baylor managed to do against Kentucky, and it came late in the second half, was to expose an old truth about great shot-blockers — the way to render them ineffective, at least once in a while, is to take the ball straight into their chests. Perry Jones III and Quincy Acy managed to get a few baskets by attacking Anthony Davis at the horizontal center of his body, where he couldn’t block shots from a distance with his long arms. Students of the game will remember how DeJuan Blair punked Hasheem Thabeet twice in 2009 with that exact same technique. It’s not unlike boxing against someone with a longer reach — you get nowhere by trying to stay outside his range. That just plays into his hands, because he can always get to you before you get to him. Instead, you have to get inside and use your strength to counteract the length. Strength beats length. Someone write it on a bulletin board. The problem here is that Louisville isn’t blessed with a lot of strong guys who can challenge Davis, and Davis is nowhere near as weak as Thabeet was. Gorgui Dieng is the Cardinals’ tallest hope, but he’s built more in the slim shot-blocker mold than the bruiser Blair mold. Freshman Chane Behanan’s thicker frame and ability to drive might make him the better option, but at 6-foot-6, he’s giving up a lot of height. The only other big man is Jared Swopshire, but he’s not much of a scoring threat. This goes along with no. 2, obviously. We’ve seen so many players look scared against Davis that we’re used to them either careening away when they attack the lane or forgoing penetration altogether. But as long as Davis patrols the paint unchallenged, there’s no way for Louisville to win. Feeding the post or having the guards charge the basket might seem like a kamikaze mission, but it’s necessary to establish the psychological principle that Louisville won’t cede the high ground. welcome to my club.) So my advice to Louisville — and anyone reading this who knows coach Rick Pitino can feel free to convey the message — is to attempt a lot of 3s and make half of them. I hope that helps. On the flip side, make sure Kentucky misses a lot of shots. Louisville has been excellent at all season at defending the 2-point field goal (opponents have the fifth-lowest percentage in D-I), and that obviously needs to continue Saturday. Kentucky’s ball-handling guards are incredibly hard to agitate. Teague and Lamb and Kidd-Gilchrist are NBA prospects, and they’ll be more talented and much bigger than the Siva-Smith-Smith-Kuric foursome at Pitino’s disposal. They’ve also performed beautifully in almost every pressure scenario this season, including the loss to Indiana early in the season. On top of that, Kentucky has the 20th-lowest turnover percentage in D-I. So it will be nearly impossible for Louisville to force turnovers with its usual pressure. But again, I urge them strongly to do it anyway. If at any point Louisville trails by 10, Rick Pitino should march over to John Calipari, extend his hand, and offer him a draw, like that kid in Searching for Bobby Fischer. Because a draw is the best he can hope for (unlike the kid, who has a master plan for winning the match; it’s not a perfect analogy), and an early deficit means death. If the Cardinals find themselves leading by 10, on the other hand, it opens up the possibility that a modicum of panic might enter the minds of the youthful ‘Cats, allowing the underdogs to hold on for dear life and steal a huge upset win. He’s one of the smartest coaches in the business, and he better have something super tricky up his sleeve. Playing with six men? Hockey substitutions? Slippery floor? Icy floor? Wooden sticks? Fights? Can that crazy fox turn this into a hockey game? Seriously, it’s not a good plan. You notice how Kentucky’s really tall? That’s the way you want to go in basketball. Minimal security at best, guys. They don’t even shut down the streets. Mark Titus's Final Four Mailbag! How's That $1 Billion Resort Coming, Real Madrid?